Puerto Limon is set on Costa Rica's Caribbean coast, a wild and beautiful area with spectacular white-sand beaches and primeval rainforests. The perfect holiday destination, this region is one of Costa Rica's most diverse geographically, from the soaring Talamanca Mountains in the south to the mangrove swamps and lagoons in the north. Puerto Limon province, of which this port city is the capital, holds the whole of Costa Rica's Caribbean coastline in its embrace. Outdoor sports are premier here and include deep-sea fishing, superb diving opportunities and eco tourism activities at the national parks. Puerto Limon province is home to the famous green turtles, and also to the last few remaining indigenous Indian tribes in the country. Puerto Limon city is a melting pot of Afro-Caribbean culture, with its superb cuisine, carnival and other festivals, as well as its welcoming, friendly people. Of note, local tourist information is generally best obtained from your hotel, since there is no official tourism office as such. The beaches around Puerto Limon really are quite magical, thanks to the fact that tourism on a big scale has yet to arrive. This means that the coastline remains quite natural in its appearance. Particularly close to the city and always popular with holiday makers is the Playa Bonita beach, where a choice of water sports is available and waves are suitable for surfing. Lying on the northern side of the city is the Playa Portete beachfront, with colourful reefs being present and snorkelling a serious pastime. Just offshore is the Isla Uvita, where further beaches await, accompanied by an interesting Christopher Columbus heritage. More information about Puerto Limon Beaches. The Avenida 2 is a good place to begin your sightseeing and this avenue starts at the pedestrian mall, next to the Parque Vargas and the sea wall, and leads towards the busy Central Market (Mercado Central), passing a number of interesting sights along the way. The market is a great place to hang out and is integral to city life, with stalls selling everything from tasty Costa Rican food to souvenirs targeting the daily alighting cruise-ship passengers. Guided walking tours are popular with tourists and last roughly an hour, beginning at the harbour gate most days. For a different kind of holiday experience, a trip to the mangrove forests of the Cariari Wetlands Park should prove memorable. More information about Puerto Limon Tourist Attractions. The city's historical Old Quarter is where the most obvious landmarks reside and features a real taster of the colonial past of Puerto Limon. This part of the city has seen much restoration work in recent years and contains some important distinctive buildings, such as the Banco National de Costa Rica and the Town Hall. The harbour walls also provide additional character to the city, with the resident waterfront eateries offering the perfect place to grab a bite to eat and watch the arriving cruise ships. More information about Puerto Limon Landmarks and Monuments. If you are expecting to find a decent selection of museums in Puerto Limon, then think again. True culture vultures looking for Costa Rican museums, heritage information and regional artefacts should note that San Jose really is the place to head, being just under two and a half hours away by road. In the city itself, the Ethno Historic Museum (Museo Ethnohistorico) is worthy of a visit, being close to the Central Market and housed within the Post Office building. Here you will find various Afro-Caribbean relics and exhibits relating to the evolution of the community. More information about Puerto Limon Museums and Puerto Limon Art Galleries. Costa Rica is really like one great big attraction, and so if you are prepared to use Puerto Limon as your base for exploration, you may like to plan a few day trips and excursions to visit the nearby rainforests, national parks, volcanoes and coastal scenery. A trip to the Monteverde Biological Cloud Forest Reserve is particularly popular, along with the Arenal Volcano National Park and the Osa Peninsula, where the Corcovado National Park resides. Tourists who enjoy outdoor activities should consider the white-water rafting and kayaking available within the Rio Sarapiqui region, while if beaches are more your thing, then the Puerto Viejo de Talamanca resort makes for a great trip, with its surfing opportunities, Finca La Isla Botanical Garden and nearby jungles. Directly to the north-west of Puerto Limon is the Parque Nacional Tortuguero, where jungle treks and boat trips offer glimpses of howler monkeys, manatees, sloths, parrots, toucans and more. 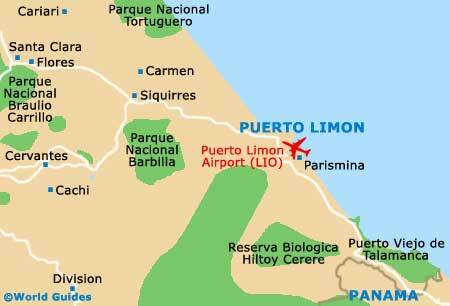 More information about Puerto Limon Attractions Nearby.